Chelsea may have lost their title, and they may lose their passionate manager Antonio Conte soon, but their spirit and fight remains very much intact. So, still, does a real chance of capturing a Champions League slot against all the odds. 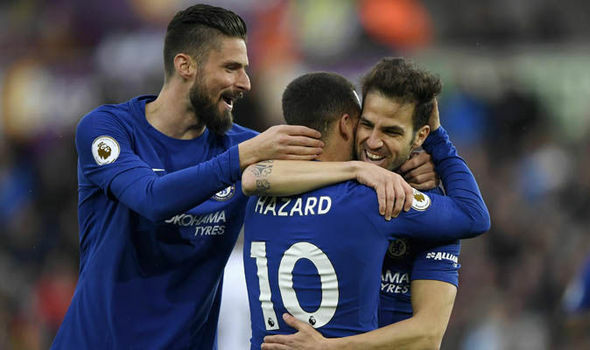 Victory thanks to an early goal from Cesc Fabregas moved them within two points of Spurs in fourth place and also within range of Liverpool above that. It was a battle all the way against Swansea, whose own hunger for the contest was plain to see as well. Defeat for the home side, though, leaves them just a point above the drop zone. They face a nerve-wracking finale to the campaign – and their home match in nine days time against Southampton, one point and one place behind in the table, now appears to be the crunch relegation match of this Premier League season. That will surely be another muck-and-nettles occasion. Chelsea were certainly thankful here to have the comfort of an early goal in the fourth minute to sustain them through the hurly-burly of a game that was mostly a relentless scrap for midfield possession. It came when Swansea’s experienced schemer Andy King carelessly gave away the ball on the halfway line. Eden Hazard pounced with ruthless brilliance to put Fabregas clear in the penalty box. he goal was scored almost in slow motion as Fabregas had oceans of space to curl a left-footed shot into the corner of the net. It was as easy as shelling peas for the Spaniard to claim his 50th strike in the Premier League. Hazard was in the mood for magic, and that always spells danger for any opponent as he skips past players with a bewitching shimmy as if the ball is tied to his feet. There were clever passes in abundance, too as Swansea battled to stay in the game. Ironically, the closest Chelsea came to a second goal before the break was when home defender Alfie Mawson’s clearance looped onto his own bar. The home side worked with endless spirit and energy – but the moment of quality or inspiration required to unlock the Chelsea defence proved elusive as rain lashed down on the Liberty Stadium. There wasn’t a single shot to trouble Chelsea keeper Thibaut Courtois in the first half. Neither side was being helped by the condition of the pitch. It appeared to have been heavily watered before kick-off and the downpour made it worse, players slipping over and passes sending up spray. It was little wonder there was barely any action in either penalty area, never mind an actual attempt on goal. Chelsea’s fans sang ‘Antonio, Antonio’ for a while in praise of their manager – a boss who seems very likely to be departing when the supporters would be happy for him to stay. It’s not like that at every football club. Conte patrolled the touchline in a relatively subdued mood that mirrored the nature of the football. The first shot on target in the second half only came in the 70th minute, a run through the Swansea team by Chelsea wing back Emerson that was comfortably saved. Moments later a touch from Victor Moses squirmed past the post after some silky brilliance from Hazard. Swansea, finally, were stirred into serious action, helped by the introduction of the creative quality of Tom Carroll. Andre Ayew curled one shot just wide in the 77th minute, and Carroll drilled another effort inches past the post with Courtois beaten. Substitute Wayne Routledge also shot straight at the keeper. It wasn’t enough, though, for a team scrapping against the drop – and defeat leaves them perilously placed.